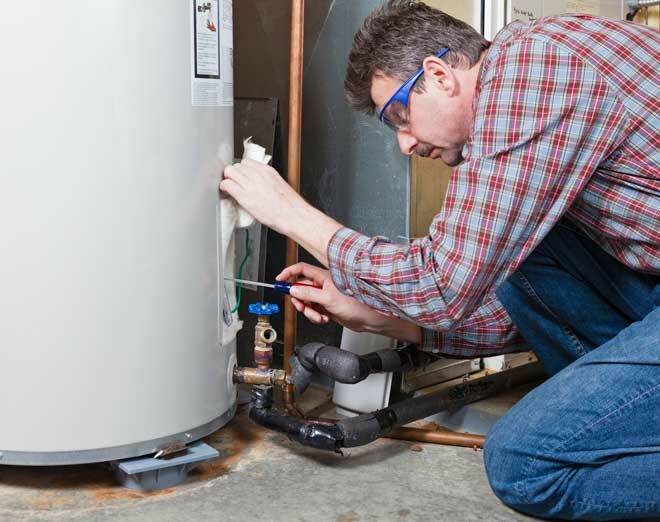 Your water heater is an important part of daily life. It provides hot water for sinks and baths, and can sometimes help reduce the risk of freezing pipes. 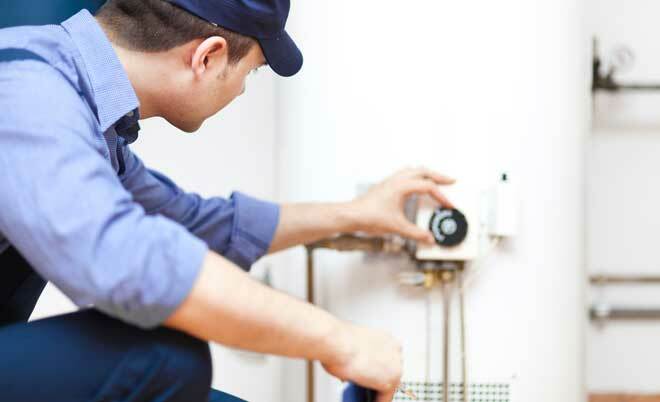 While modern water heaters are durable, they are not immune to developing leaks. These leaks may cause property damage, lead to mold, or even cause the heater to fail completely. Thankfully, it is often possible to diagnose and repair heater leaks by yourself. While it may at first seem as though your water heater is leaking, there may be other causes for puddles and moisture accumulating around the heater. By determining the source, it is possible to save both time and money as you can fix the actual cause. Be careful coming into contact with water radiating heat, as there is a risk of serious burns. The following are a few common causes of water accumulation that may be mistaken for a heater leak. Perhaps the most common source of water, condensation is common in basements and especially frequent during damp weather. Condensed moisture may come from the heater as well as nearby pipes and appliances. You may not see the water droplets, in which case the paper towel method is a convenient test. Simply take a paper towel and slowly wipe it along the outer surfaces of all appliances and pipes in the vicinity being careful not to burn yourself on hot water pipes. If the paper towel becomes damp gradually as you cover a particular surface, condensation is your most likely source. Installing a dehumidifier in your basement will usually remedy the situation without any further measures. Another common cause of puddles, you may sometimes be able to observe the droplets forming at joints. Paper towels are again useful in determining the source. Dry the floor and place a paper towel under suspect joints. Then wipe the pipes to ensure the problem is not condensation. Come back after a few hours and check the paper towels for signs of a drip. If the towel is soaking water from the edge, then your source is elsewhere. Another sign of a leak is your paper towel suddenly becoming damper at a pipe joint instead of even dampening over a larger area. Basement floors, especially older ones, are often slightly uneven. This leads to minor depressions where moisture pools. Basements that have a drain usually gently slope downwards to prevent flooding while maintaining the illusion of a level floor. Unfortunately, uneven floors may lead to pooling. Place some paper towels around your heater where the puddles are forming after drying the area thoroughly. Check the towels occasionally for signs of moisture. In the event the paper towel is absorbing water from the edge and not the center, you will know the water is running along the floor from elsewhere. Lay paper towels one at a time starting near the wet edge to trace the path of water to its source. Nearby appliances, such as a washer, may be the source of leaking water. Other times, the source could be a leaky overhead pipe where the water is following a slight depression in the floor. In the former case, your trail will end at the appliance, while in the latter; it will stop underneath the leak. Once you have determined you heater is the source of the leak, there are a few steps which you must follow before starting repairs. These steps should be followed in order and with caution, as you are working with an appliance capable of causing first degree burns from direct and even possibly indirect contact with the water if the settings are on maximum. 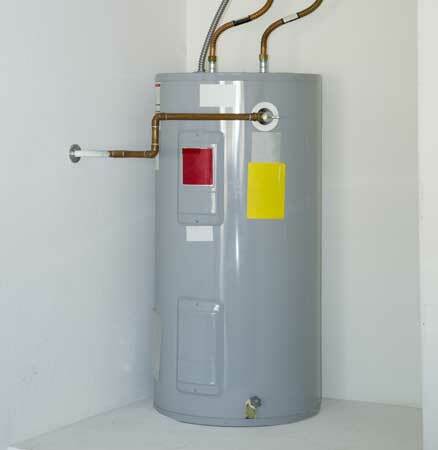 Modern water heaters are generally gas or electric. The methods for shutting off power differ between the two. Electric water heaters are connected directly to the circuit breaker. Simply find the breaker associated with the heater and shut it off. Gas water heaters have a power switch or dial. Make sure it has been set to the off position, being careful not to close the gas shut-off valve. Regulation requires that a shut-off be located above the water heater. This may be a pull-down switch or a gate valve. In the event you cannot reach it without coming into contact with hot water, you will need to access your home’s main water shut-off and cut the supply from there. Leaks emanating from the upper portion of the water heater are usually minor and can be fixed without calling a professional. Easily identified by a small pool of water atop the heater, the loose fitting may be either the inlet or outlet pipe. The problem may be either where the pipe connects to the heater or to other fittings. If there is no sign of corrosion or serious damage to the pipe, simply tighten with a pipe wrench. Commonly referred to as the T&P valve, this fitting is located on the side of your tank and should be watertight. Water running down the side of the heater may be caused by a leaking T&P valve. Examine the threads at the base of the valve for signs of leakage or use your trusty paper towels to check for moisture. In the event the leak is coming from the threads, you will need to remove the valve to find the underlying source. Locate a nearby hot water tap and turn it on. This will not only drain out some of the hot water, but also provide a means for air to enter the tank as you drain it. Next, run a garden hose from the drain valve near the bottom of your heater to your basement drain or sump pump. Make sure that the hose is not elevated or the tank will not drain properly. Now open the valve. You may need to use a screwdriver if there is no wheel. Once the water has drained below the valve level, remove the latter with a pair of channel locks. There should be no corrosion or rust inside the opening, which is a sign that the heater must be replaced. Wrap the valve’s threads with some Teflon tape and reattach for a tighter fit. It is more common for leaks to occur from the bottom of the tank. Unfortunately, these leaks are also more serious and usually require professional repair or even replacement of the entire tank. There are three major causes of lower tank leaks. Used for regular maintenance, the drain valve at the bottom of your tank may develop a leak. Moisture may form around the edges if the valve is no longer water-tight. It is also possible that the valve is faulty. In both cases, you can replace the drain valve yourself by following the instructions included with the new drain valve. The most frequent cause of a leak is damage to the tank itself. If not properly maintained, sediment can build up, causing the tank to crack or rust. In some cases, an internal component is leaking. Replacing the tank is necessary in both cases. The purpose of the temperature and pressure relief valve is to reduce internal pressure and vent if the water becomes too hot. A discharge tube runs from the valve to the floor for safety. Puddles beneath the tube may be a sign of a pressure issue. Roll up your paper towel and check the inside of the tube to make sure it is dry. Moisture in the tube suggests either a pressure problem or faulty valve. You can replace the valve yourself, but will need to contact a professional to fix a pressure issue. While your water heater requires very little maintenance, giving it some attention will help prevent leaks and extend its lifespan. These checks are relatively quick and may even identify a problem in its early stages. In addition to the following maintenance routines, be sure to follow any manufacturer recommendations. Every two months, give your tank a physical to ensure it is in perfect working order. Examine all pipes and fittings for signs of leakage or corrosion. Pay attention for traces of gas in the air if you have a gas heater. Run a nearby hot water tap and listen for unusual noises, which may suggest a serious problem with your heater. Finally, make sure the T&P valve opens and closes without any issues. Every six months, shut off the power and water to your tank, using up hot water to cool the tank’s contents. Turn on a nearby hot water tap and run a garden hose from the drain valve to your sump pump or basement floor drain. Open the valve and allow several gallons to empty from the tank. Next use a bucket or sieve to check some of the water for sediment. A moderate to large amount means you must repeat the process. Once there is little or no sediment present, allow a few more gallons to drain before closing the valve and turning the water supply back on. You will know the tank has filled when the open hot water tap is releasing water at full pressure. At this point, you may turn the power supply back on. Once your tank is approximately three years old, you will need to perform an annual check of the anode rod. This rod is generally located near the cold water inlet at the top of the heater, and has an average lifespan of four to six years. Simply remove the rod and check for significant pitting or chipping. Minor corrosion or pits are normal, but more extensive damage indicates you should replace the rod. When is a Professional Necessary? Many sources of leakage are easily repaired, but some require professional attention. Signs of corrosion, rust, or an internal leak are sure signs that the tank needs replaced. You may also need to contact a professional if you are unable to locate the cause of the leak or your tank continues to leak after you have attempted to repair the problem. As of April 16, 2015, all water heater manufacturers must follow NAECA (National Appliance Energy Conservation Act) standards as amended in the Department of Energy’s 2010 ruling. The Appliance Standards Awareness Project offers information and related documents on this ruling and how it affects new water heaters. The Department of Energy offers a detailed guide on selecting a new water heater, including solar and geothermal tanks. In the event you need to replace your tank, CostHelper provides cost averages for various types of water heater and professional installation fees. This Old House provides a video guide illustrating how to properly install a new water heater.